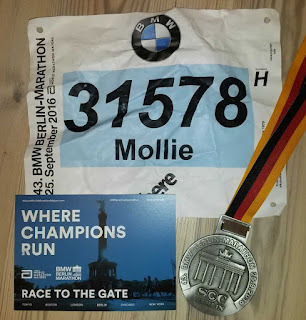 Berlin Marathon was my 4th marathon but my 2nd big one. It was so much fun so travel to Germany with Sabine, of My Life My Challenges, and meet up with the Advent Running/Adidas Runners London crew. I love visiting new places and running through them is even more fun. Sabine and I had big plans to do lots of touristy stuff around town, but because of all the fun marathon events, we only made it to the Berlin Zoo. If you ever get a chance to run with Adidas Runners, I highly recomend it. The Berlin group was so welcoming during the shake out run and pasta party at their base. 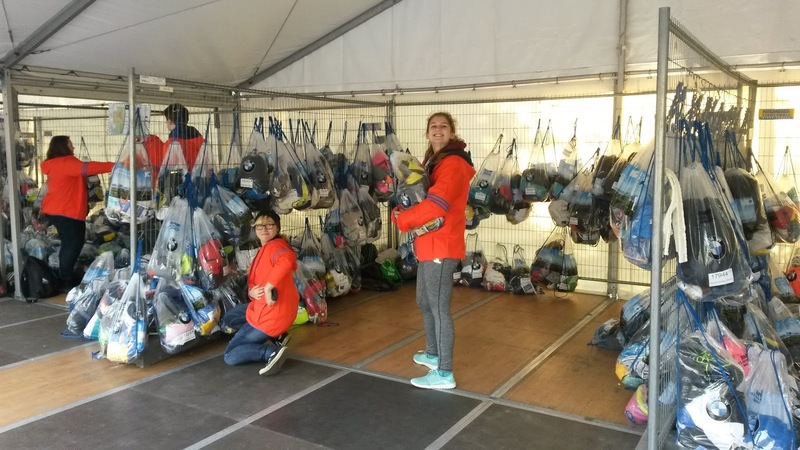 Adidas also hosted a marathon base for us to get ready, drop off our bags, and then eat afterwards. 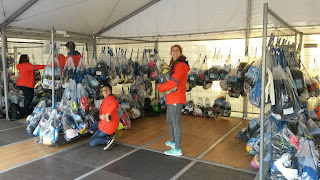 Because of this luxury, I cannot comment too much on the logistics in the runner village at the race. Race entry: I didn't even know it was hard to get a spot as I was awarded an entry on my first try (I always have said I was good at games that don't involve knowledge or skill). 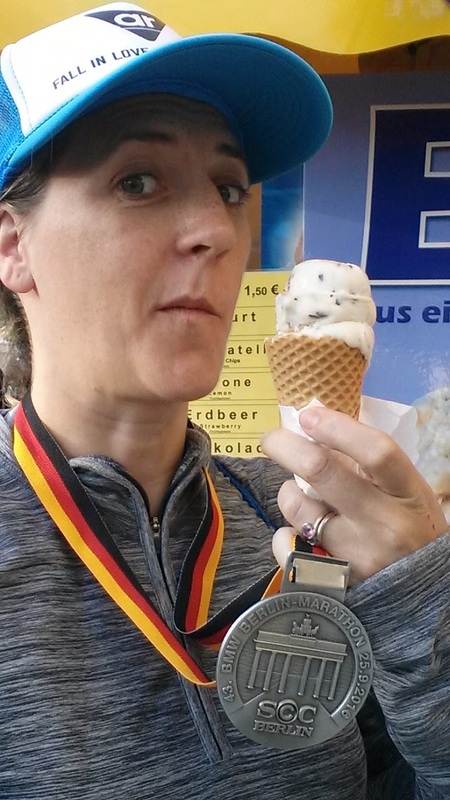 For 2017, you can enter Berlin Marathon through a ballot of 40,000 runners. I am not sure if there is good-for-age entries available. In 2017, there will also be a 3-person relay option available, which would be a good way to take part if the 26.2 miles intimidates you. You pick up your race packet at the expo and are tagged with a ribbon bracelet. You must where this all weekend to get into certain events and the race village too. The packet pick up was a well-oiled machine with several stages- ID check, ribbon bracelet, packet pick up with your bib printed right then and there. Sabine and I went over to the expo area after and spent hours there! Shopping, run analysis, sports massage, and sausages in the sun. Course and bogs: The course takes you all over Berlin and it known for being fast and flat (hence all the world record-breaking times). We didn't see as many tourist sites along the route as I thought we would (based on what was highlighted on the course map), but there were bands along the way for entertainment. As I mentioned above, I was lucky enough to be invited to hang out with Adidas Runners Berlin, so I was able to use their bag drop and loos. Lines for the loos were so long at the start line, I didn't even bother. Only once the race started (we were in the last wave) did I jump the barrier to go for a quick wee. 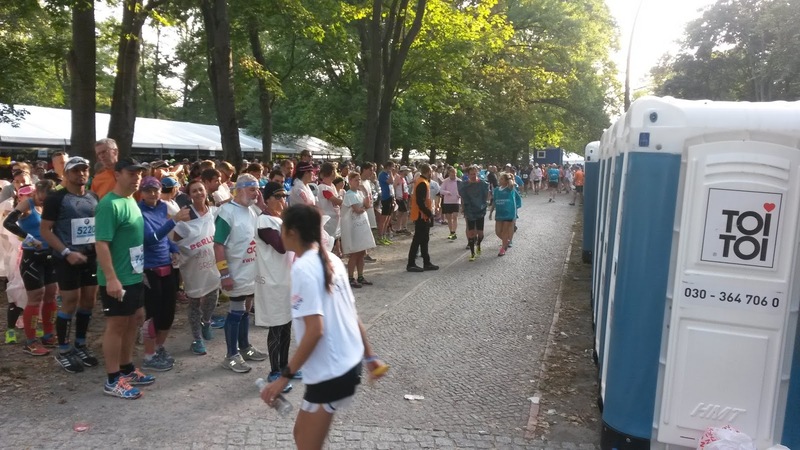 Each water station had a few loos but there was always a queue so I never stopped. Instead a took a wee in the bush, in a parking lot and in a cafe. I have never had so many pee breaks in a race before (nor peed outside so much!). My PB would have been more impressive if I didn't have to make so many stops. The bag drop area looked very well organized but I cannot comment on if it worked well for bag pick up. A few charities and run clubs had cheer stations which were a nice boost along the way. I was really looking forward to seeing the Adidas Runners cheer squad, but they had decreased in size by the time I got there. Atmosphere: This race is pretty serious. There aren't any official pacers beyond 4:15 which means most people are aiming to be quick. There was some people cheering from the sidelines and not much fancy dress/costumes on the runners. People were there to run! Things to know if you want to take part next time: Not a great race for those who run 5+ hour marathons as anything slower than 4:15 is in the last pen and there aren't any pacers. The event area shuts down too if you are at the 'slow' end. It isn't often that I run such a big race so I forgot to take in bottlenecks when setting my pace. 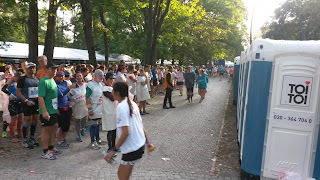 The water stations really slowed me down as they were crowded and there was a carpet of cups lining the road. I would suggest training for a little faster pace to make up for these areas. Also, the finish line is further than it looks. I thought the Erdinger arches were the finish, but they weren't. Then I though Brandenburg Gate was the finish, but it was actually a bit beyond that. So keep running until they make you stop! Finally, the newspaper on Monday prints a special section listing all the race finishers and their times. We waited until late in the day to pick up a copy which meant we had to make several stops before we were able to find a copy. Overall, I had an awesome weekend. Thanks to PlusHotels Berlin for being so accommodating to all the guests who were taking part in the marathon too. Did you run Berlin this year? If so, leave a comment below and let me know what you thought of the race village, bag check, loo lines, and free non-alcohol beer.